SOURCE: AP/ELISE AMENDOLA In this file photo from Aug. 10, 2001, a technician holds a pipette next to a plate containing mammalian egg cells, in the research lab at Advanced Cell Technology in Worcester, Mass. An earlier version of this column indicated incorrectly that Advanced Cell Technology had been granted FDA approval for a clinical trial. The FDA has granted the therapy orphan drug status, but trial approval is still pending. We regret the error. Imagine that you are 13 years old and discover you are losing eyesight in the central portion of the visual field. There is hardly a part of the great adventure ahead, from learning to sports to dating, that is not changed forever by Stargardt’s Disease, an inherited disorder that resembles adult macular degeneration. A familiar trope of conservative critics of embryonic stem cell research was that regarding health problems as a crisis could provide ethical justification for just about anything. But how exactly is a young teenager’s degenerative eye disease not a crisis, not only for that child but for that family? Medical intervention should not be the only response; parental support, counseling, classroom arrangements, and low vision devices are all important. Patients can and do live active and happy lives with a wide range of opportunities. There is no denying that we all live with disabilities or acquire them, nor that we cannot profit from life’s challenges. And if regenerative medicine can offer a promising new therapy with reasonable risks to subjects, well, that’s not bad either. On Tuesday, the Food and Drug Administration granted orphan drug status to cells derived from human embryonic stem cells by Advanced Cell Technology that will treat Stargardt’s. This bodes well for approval for a clinical trial. This is not only an important step in normalizing the field as a regulated scientific activity. It also speaks to the sometimes-unpredictable ways that experimentation can address sources of human suffering. And it is a clear example of the way a smart regulatory system in a liberal democracy can respond to both a medical need and a market opportunity with no moral inconsistency. Thus what is in some respects even more interesting than the fact that the company’s approach to a retinal disorder involves cells from embryos is that the FDA approval took place under the auspices of the Orphan Drug Act. The Act encourages innovative approaches to serious diseases that affect fewer than 200,000 Americans, conditions unlikely to attract private investment without additional incentives. The rare kind of macular degeneration that the therapy will attempt to alleviate afflicts mostly children. The idea—for which there is already support in laboratory and animal studies—is that embryonic stem cells can be pushed to become the retinal cells destroyed by Stargardt’s. It was just early last year that biotech company Geron obtained permission from the FDA for the first embryonic stem cell trial. It will never be known how much of a chilling effect Bush administration policy had on the willingness of private companies to invest in the field, but conservatives and progressives alike understand that targeted, private-sector innovation is as critical for a healthy economy as it is for improving human life. Someday therapeutic modifications in the gene that causes Stargardt’s Disease might be possible, but there might be too many harmful mutations to make direct gene therapy practical. That question, too, will surely be answered someday. Meanwhile, we may hope that the recent designation succeeds in moving the therapy forward and throws more light on this form of macular degeneration and on the lives of the kids who suffer from it. An earlier version of this column indicated incorrectly that Advanced Cell Technology had been granted FDA approval for a clinical trial. The FDA has granted the therapy orphan drug status, but trial approval is still pending. We regret the error. Imagine that you are 13 years old and discover you are losing eyesight in the central portion of the visual field. There is hardly a part of the great adventure ahead, from learning to sports to dating, that is not changed forever by Stargardt’s Disease, an inherited disorder that resembles adult macular degeneration. A familiar trope of conservative critics of embryonic stem cell research was that regarding health problems as a crisis could provide ethical justification for just about anything. But how exactly is a young teenager’s degenerative eye disease not a crisis, not only for that child but for that family? Medical intervention should not be the only response; parental support, counseling, classroom arrangements, and low vision devices are all important. Patients can and do live active and happy lives with a wide range of opportunities. There is no denying that we all live with disabilities or acquire them, nor that we cannot profit from life’s challenges. And if regenerative medicine can offer a promising new therapy with reasonable risks to subjects, well, that’s not bad either. On Tuesday, the Food and Drug Administration granted orphan drug status to cells derived from human embryonic stem cells by Advanced Cell Technology that will treat Stargardt’s. This bodes well for approval for a clinical trial. This is not only an important step in normalizing the field as a regulated scientific activity. It also speaks to the sometimes-unpredictable ways that experimentation can address sources of human suffering. And it is a clear example of the way a smart regulatory system in a liberal democracy can respond to both a medical need and a market opportunity with no moral inconsistency. Thus what is in some respects even more interesting than the fact that the company’s approach to a retinal disorder involves cells from embryos is that the FDA approval took place under the auspices of the Orphan Drug Act. The Act encourages innovative approaches to serious diseases that affect fewer than 200,000 Americans, conditions unlikely to attract private investment without additional incentives. The rare kind of macular degeneration that the therapy will attempt to alleviate afflicts mostly children. 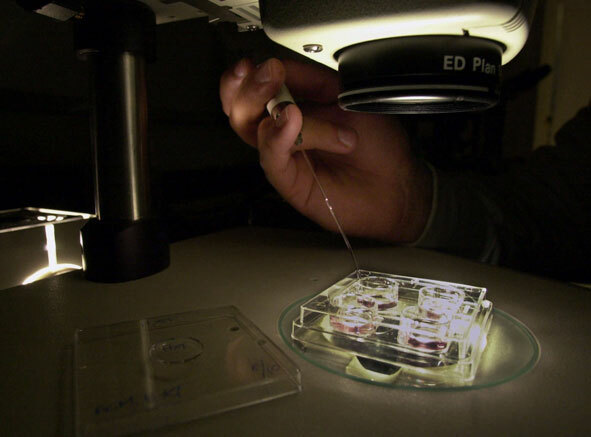 The idea—for which there is already support in laboratory and animal studies—is that embryonic stem cells can be pushed to become the retinal cells destroyed by Stargardt’s. It was just early last year that biotech company Geron obtained permission from the FDA for the first embryonic stem cell trial. It will never be known how much of a chilling effect Bush administration policy had on the willingness of private companies to invest in the field, but conservatives and progressives alike understand that targeted, private-sector innovation is as critical for a healthy economy as it is for improving human life. Someday therapeutic modifications in the gene that causes Stargardt’s Disease might be possible, but there might be too many harmful mutations to make direct gene therapy practical. That question, too, will surely be answered someday. Meanwhile, we may hope that the recent designation succeeds in moving the therapy forward and throws more light on this form of macular degeneration and on the lives of the kids who suffer from it. Jonathan D. Moreno, Ph.D., is the David and Lyn Silfen University Professor of Ethics and Professor of Medical Ethics and of the History and Sociology of Science at the University of Pennsylvania, and the Editor-in-Chief of Science Progress.